Torquay have followed up the signings of keepers Nathan Abbey and Martin Horsell by capturing Carl Motteram and Chris McPhee on permanent deals. 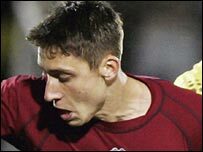 Midfielder Motteram, 21, was released by Birmingham City following their relegation from the Premiership. He has now signed a one-year contract at Plainmoor. Meanwhile, McPhee, 23, was let go by Brighton after they were relegated from the Championship - but has also put pen to paper to sign for the Gulls. McPhee had hoped to join Swindon, after ending last season on loan there.